We embark on many journeys in life – some by choice, others by chance and some that seem forced upon us. How we choose to navigate through these situations speaks loudly of who we are and who we can become. The pain started in the fall of 2008. After 14 months of doctors’ visits with no answers, I was finally diagnosed with interstitial cystitis/painful bladder syndrome, then pelvic floor muscle dysfunction and finally vulvodynia. My life hasn’t been the same since. I had an active lifestyle as a full-time volunteer minister and small farm owner. I was happily married to the most wonderful man. 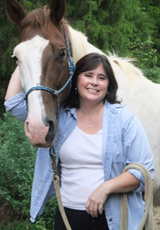 I enjoyed working with and riding my own horses, as well as helping friends with theirs. That active life came to a crashing halt when the pain started. I thought my life was over. I even contemplated ending my life. Instead of choosing to learn from this journey, I simply wanted to end it. Thankfully, with much help from therapy and medication, plus support from my husband, family and friends, my journey continues. I hope that by sharing my experience I can in some small way help others. I have learned so much about myself these past few years. For one, I’ve always considered myself a bit of a wimp. Was I ever wrong! I didn’t realize it until recently, and still doubt it on some days, but I now know I am a lot tougher than I ever thought. No one could go through what I’ve been through without strength. I’ve learned that being tough doesn’t mean that you can’t ask for help. Before the pain, I was the person others asked for help, not the one seeking it. After, I felt virtually useless and incorrectly assumed that no one would want to help me. Was I ever wrong! In fact, I found that people wanted to help because they loved me for me, not because of what I could do. I now know that despite my disability, I am still a useful person. It just takes a bit more creativity. This journey has also taught me that some parts of life are uncontrollable. I cannot control the fact that I have these pain disorders, but I can control how I face these obstacles. I’ve realized the importance of staying informed, seeking treatment – both conventional and alternative – and never being too timid or embarrassed to ask questions or for help. I’ve spent a lifetime helping others, but now I am comfortable focusing on my own needs before trying to meet the needs of others. My journey continues. I see my doctors on a regular basis and am still experimenting with medications and therapies. I’m able to spend a few hours a week in the ministry, and our horses are happily enjoying retirement on our farm. A friend recently sent me a card that read, “Like a month-old macaroon, you are one tough cookie.” For better or worse, this has become my battle cry!